In the first cool days of autumn, many of us are making sure we have plenty of heating fuel and digging out our winter coats as we brace for the full impact of cold and flu season. But what about our pets? What can we be doing now to prepare them for a healthy winter? Different dogs cope with winter differently. A German Shepherd is not going to feel the cold as much as a Greyhound or a Maltese. Not all dogs will need a winter dog coat, but they can all benefit from a few checks to make sure they are ready for the cold and wet. Pre-Winter Vet Check: Health problems can creep up on older pets. Dogs are very stoic and sometimes just carry on even when in pain. But winter can aggravate some conditions. Better to take your dog in a for health check now and see if anything is lurking around the corner that you can address now, before it gets worse in the cold. Arthritis is a prime example of the type of problem a pre-winter vet check can catch. Parasite Treatments: It’s a common myth that fleas and ticks disappear in the winter. While they are worse in the summer, they do survive Irish winters. So don’t stop treating for them just because autumn is upon us. Autumn Grooming: Dogs have been out enjoying themselves in the garden and on outings to parks, beaches and forests over the summer. In other words, they are a mess! Bathing a dog in the cold weather isn’t recommended. So why not give them a good bath now so they only need regular grooming to keep them clean over the winter? No one diet is right for every dog. Different breeds, ages and activity levels have different needs. A working dog needs to eat a diet rich in protein and oils, while a couch-loving house dog needs to avoid excess calories. 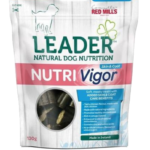 A dog that is indoors most of the time and maintains the same activity level throughout the year doesn’t need any changes to his diet for winter. But a working dog on a farm or a dog that is out pointing and retrieving in the autumn will need to increase his calories over the winter. 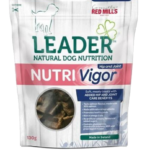 Some dogs benefit from switching from Connolly’s RED MILLS Leader line of dog food to the Engage range of premium foods for working dogs if they enjoy a leisurely life most of the year but join their humans hunting game birds in autumn. Older dogs are vulnerable to arthritis in winter, and some breeds are particularly prone to hip problems. It’s important to help dogs stay trim to ease the pressure on their joints. While no diet can cure arthritis, some nutrients can help keep joints healthy. That’s why Connolly RED MILLS developed the Nutri Vigor Hip and Joint treats. Rich in omega 3 and 6 oils, these all-natural treats are made with salmon, peas and oats. They promote healthy cartilage to keep the pep in your dog’s step. All dogs tend to suffer dry skin in the winter, particularly those beloved pets who enjoy the warmth of living indoors. To counter this, owners don’t need to make any dramatic dietary changes. Simply giving Nutri Vigor Skin and Coat treats daily can bring a shine to your dog’s coat and keep his skin soft and healthy. Regular brushing is also an important part of caring for your dog’s skin and fur. It removes old fur and dead skin, while encouraging good blood circulation and natural skin oils. If your dog spends a lot of time out in the garden, this is the time of year to inspect his dog house and make sure it is in good repair. Check the roof for leaks, and give it a good clean inside and out. Inside, your dog will enjoy a snuggly, soft bed, especially as he ages. Is his current bed thick enough to provide enough cushioning? Your dog will be wet when coming in from the garden or a walk, and the best way to prevent a chill and to protect your home from mud is keep an old towel by the door to dry him when he enters. Whether you and your dog are taking a quick jaunt around the estate or hiking in the woods for a couple of hours, when the weather is cold and wet, a dog coat will keep him comfortable. Smaller dogs especially need one that covers their belly too. The most important criteria when selecting a dog coat is waterproofness. But it also helps to find one that is high-visibility with reflective materials. Measure your dog carefully before buying – or better yet, find a local store that will let your dog try it on before purchase – to ensure a good fit. Winter is a great time to cosy up by the fire with your best friend and a book or movie. But your dog will need to go outside too! And it is important to protect him from the elements according to his personal needs. When in doubt, ask your vet for advice. She knows your dog and the risks that pose the greatest threat to him.